Preview all 18 finished projects in our exclusive Look Book! "What eye candy! The very talented Tammy Hildebrand has given crocheters both a good foundation of 6 techniques as well as wearable and versatile wraps. You'll find not only the ubiquitous shawls, but ponchos and ruanas as well. There's something for everybody here. I defy you to not find something that instantly makes you want to buy this book!" 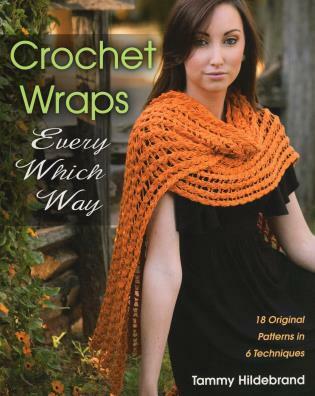 Tammy Hildebrand is the author of Crochet Wraps Every Which Way and Vice President of the Crochet Guild of America. Her designs have appeared in many publications, including Interweave Crochet, Crochet!, Crochet World, Crochet 1-2-3, and the book Unexpected Afghans, as well as in the collections of major yarn manufacturers and distributors. She blogs at hotlavacrochet.blogspot.com and lives in Kernersville, North Carolina.